Our last report on Agrigan volcano covered a May 1992 field visit (BGVN 17:06) by a six-member team of USGS volcanologists that visited the Commonwealth of the Northern Mariana Islands (CNMI) at the request of the CNMI Office of Civil Defense. The team detected thermal activity, but no seismicity, deformation or other signs of an eruption. The following came from a report by both the USGS and CNMI issued mid-July 2007and labeled Current Update. "An earthquake was reported felt on Agrigan island at 3:49 pm July 16 local time. About 3 seconds of shaking was reported by a local resident. Seismometers on Sarigan and Anatahan recorded the earthquake and allowed estimation the magnitude at approximately 3.3. No sulfur smell or any other signs of volcanic activity were reported on July 16 or in a follow up call on July 17." Some 2012 and 2013 observations were equivocal. On 29 February 2012, NOAA's Washington Volcanic Ash Advisory Center (VAAC) inferred ash and gas emissions here for the first time on record, but this was later discounted due to lack of forthcoming evidence. The inferred plume was seen in satellite infrared imagery. It extended 74 km NW from the summit. A possible volcanic plume from Agrigan was spotted again by the VAAC in a satellite image from 22 January 2013. In a 25 January 2013 USGS update, it was noted that neither the USGS nor NOAA received confirmation of a volcanic source for the satellite anomalies. The authors of the 2013 update interpreted the cloud as weather-related and not volcanic in origin. Figure 2 shows a photo of Agrigan taken in June 2013. No hotspots were detected during mid-2012 to mid-2013 by the MODVOLC Thermal Alerts System. Figure 2. Agrigan as seen on 15 June 2013. Photo credit to Yoshi Tamura; featured here thanks to cooperation of Robert Stern. Agrigan, the highest-standing stratovolcano and largest (by subaerial volume) in the Northern Mariana Islands, stands 882 m a.s.l (figure 3). The island is ~10 by 6.5 km (N-S by E-W) in size, with a surface area of 52.7 km2. The volcano's subaerial volume is ~15.9 km3. The summit contains a large depression, roughly 1.5 by 1.2 km in diameter, and 380 m deep. A spatter cone and flows from the 1917 eruption cover ~50 percent of the crater floor. This large crater implies a local edifice with shallow magma storage within the volcano. The flanks of the volcano are steep (>30 degrees), with deep furrows extending radially away from the crater. To the north is a large canyon into which a recent, large 'a'&#257 flow advanced to form a delta on the coast. Pyroclastic flow deposits mantle most of the interior of the island. Rocks erupted on the island range from basalt to andesite. The southwest coast has several beaches composed of mineral sands; otherwise, the coast is rocky. (Trusdell, F.A. and others, 2009). Figure 3. Geologic map of Agrigan with 200 m contour intervals (after Stern, 1978) and location map (after Trusdell and others, 2006). References. Sako, M. K.; Trusdell, F. A.; Koyanagi, R. Y.; Kojima, George; Moore, R. B., 1995, Volcanic investigations in the Commonwealth of the Northern Mariana Islands, April to May 1994, USGS Open-File Report 94-705. Stern, R.J., 1978, Agrigan: an introduction to the geology of an active volcano in the Northern Mariana Arc: Bulletin of Volcanology, v. 41, p. 43-55. Trusdell, F.A., Moore, R.B., and Sako, M.K., 2006. Preliminary Geologic Map of Mount Pagan Volcano, Pagan Island, Commonwealth of the Northern Mariana Islands, USGS Open-File Report 2006-1386 (URL: http://pubs.usgs.gov/of/2006/1386/). Trusdell, F.A. 2009, Geology of the Mariana Islands, in Gillespie, R.G., and Clague, D.A., eds., Encyclopedia of Islands: Enclyclopedias of the Natural World, 2, University of California Press, Chap. 18. P. 598-603. Information Contacts: Emergency Management Office of the Commonwealth of the Northern Mariana Islands (EMO-CNMI) and USGS Volcano Hazards Program, PO Box 100007, Saipan, MP 96950, USA (URL: http://www.cnmihsem.gov.mp/ and http://volcanoes.usgs.gov/nmi/activity/); Washington Volcanic Ash Advisory Center (VAAC), Satellite Analysis Branch (SAB), NOAA/NESDIS E/SP23, NOAA Science Center Room 401, 5200 Auth Rd, Camp Springs, MD 20746, USA (URL: http://www.ospo.noaa.gov/Products/atmosphere/vaac/); Hawai'i Institute of Geophysics and Planetology (HIGP), MODVOLC Thermal Alerts System, School of Ocean and Earth Science and Technology (SOEST), Univ. of Hawai'i, 2525 Correa Road, Honolulu, HI 96822, USA (URL://httphotspot.higp); Robert J. Stern, University of Texas at Dallas, 800 W Campbell Rd Richardson, TX 75080; and Yoshi Tamura, Institute for Research on Earth Evolution (IFREE), Japan Agency for Marine-Earth Science and Technology (JAMSTEC), Yokosuka 237-0061, Japan. The Global Volcanism Program has no Weekly Reports available for Agrigan. An overflight on 1 August revealed increased fumarolic activity at the volcano [(figure 1)]. Nine residents were evacuated from the island. No felt earthquakes were reported. Figure 1. Geologic map of Agrigan after Stern (1978). Contour interval is 200 m.
Reference. Stern, R.J., 1978, Agrigan: an introduction to the geology of an active volcano in the Northern Mariana Arc: BV, v. 41, p. 43-55. Information Contacts: R. Koyanagi, HVO; F. Sasamoto, Office of Civil Defense, Saipan. Fieldwork was conducted . . . 28 September-3 October, following reports of increased activity 1 August and the subsequent evacuation of the island's residents. Visits to the summit revealed weak fumarolic activity with sulfur deposition and boiling hot springs. A preliminary seismic study indicated very low levels of local activity, with no sign of a recent increase. A regional network of single vertical-component, short-period seismometers was installed, with instruments located on the islands of Pagan, Alamagan, and Anatahan, and a receiving station on Saipan. The residents evacuated in August had not returned to their homes as of early October. A seven-member team of USGS volcanologists visited the CNMI 24 September-6 October at the request of the Office of Civil Defense. The following is from a report by Richard Moore. "On Agrigan, the team established a new EDM network within the summit caldera, and hope to remeasure it in 1991. At that time, geologic investigations terminated by tropical storm Hattie on 2 October 1990 would be continued. "A revolving drum seismograph operated continuously 28 September-1 October at a village near the coast, and a portable seismograph operated intermittently 28-29 September at several sites on the caldera floor, recorded no sustained microearthquake activity or volcanic tremor on Agrigan. "The team discovered a boiling hot spring, associated terrace deposits, and solfataras at the 1917 eruption vent (Agrigan's most recent) on the floor of the 1.5-km-diameter caldera. Steam was being emitted from several areas at the base of the caldera wall. Temperatures of the boiling hot spring and 25 solfataras measured by thermocouple were all 98°C. Water from the hot spring had a pH of 2.0. Chemical analysis of the water is in progress. Several measurements (using Kitagawa and Draeger tubes) of the abundances of various gases emitted by the solfataras are summarized in table 1. Table 1. Range in compositions of gas samples collected at Agrigan, September-October 1990. Courtesy of Richard Moore. "The team found no evidence of new fuming on Agrigan (suggested by reports in August and cause of the island's evacuation; 15:7). Hot spring terraces composed of siliceous sinter covered an area of ~20 x 7 m2 below the boiling hot spring. The terraces are now mostly dry, with current deposition of silica limited to a few square meters adjacent to the hot spring, suggesting that activity was more vigorous sometime in the past. However, fluctuations in the volume of flow from the spring may occur as a result of seasonal variations in rainfall." Remeasurement of five EDM lines on 15-16 May yielded no significant changes (>1 cm) since the network was established in September 1990. Two seismometers temporarily operated on the caldera floor recorded no local shallow seismicity. The temperature of the boiling spring in the caldera was 98°C, the same as in 1990. The volume of water issuing from the hot spring was less than in 1990, maybe because of seasonal rainfall variations. The highest measured fumarole temperature was 102°C, 4° higher than in 1990, perhaps related to a drop in the water table. The highest of the Marianas arc volcanoes, Agrigan contains a 500-m-deep, flat-floored caldera. The elliptical island is 8 km long; its summit is the top of a massive 4000-m-high submarine volcano. Deep radial valleys dissect the flanks of the thickly vegetated stratovolcano. The elongated caldera is 1 x 2 km wide and is breached to the NW, from where a prominent lava flow extends to the coast and forms a lava delta. The caldera floor is surfaced by fresh-looking lava flows and also contains two cones that may have formed during the only historical eruption in 1917. This eruption deposited large blocks and 3 m of ash and lapilli on a village on the SE coast, prompting its evacuation. Stern R J, 1978. Agrigan: an introduction to the geology of an active volcano in the Northern Mariana Island Arc. Bull Volcanol, 41: 43-55. There is no Deformation History data available for Agrigan. There is no Emissions History data available for Agrigan. 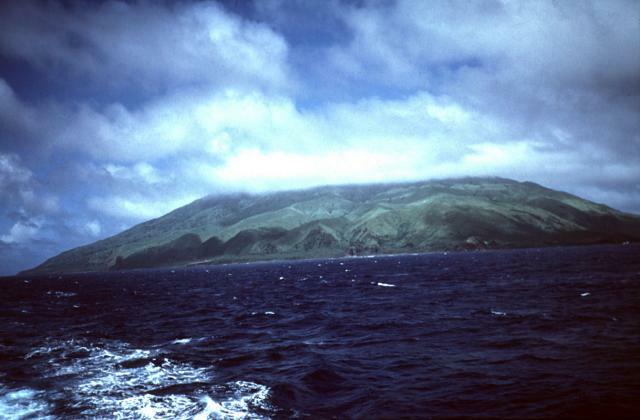 Clouds drape the flat-topped summit of Agrigan, the highest of the Marianas arc volcanoes, in this view from the south. The elliptical island is 8 km long; its 965-m-high summit is the top of a massive 4000-m-high submarine volcano, the second largest in the Mariana Islands. An elongated summit caldera is 1 x 2 km wide, 500 m deep, and is breached to the NW. The vegetated flanks of the volcano consist almost entirely of pyroclastic deposits that are more than 100 m thick on the SW flank. The Global Volcanism Program has no maps available for Agrigan. The following 29 samples associated with this volcano can be found in the Smithsonian's NMNH Department of Mineral Sciences collections, and may be availble for research (contact the Rock and Ore Collections Manager). Catalog number links will open a window with more information. Large Eruptions of Agrigan Information about large Quaternary eruptions (VEI >= 4) is cataloged in the Large Magnitude Explosive Volcanic Eruptions (LaMEVE) database of the Volcano Global Risk Identification and Analysis Project (VOGRIPA).